A belt is a major fashion accessory; it’s seldom just for keeping your pants up. If you want it to complement your appearance, then a generic belt from a thrift shop is hardly going to cut it for making a fashion statement. 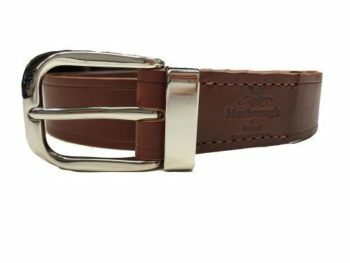 Our leather belts are a staple Marlborough of England item. This means it is handcrafted from genuine leather with a brass nickel plated buckle. Every belt is stitched by hand, and no two are exactly alike. It’s also available in your choice of tan or black chestnut colour. Custom colouring is available upon request. Aside from its stylishness, our leather belts are also designed for longevity. Even if used daily, the belt will hold up and not fade, crease, or show other signs of wear. The buckle is also just as durable and will maintain its shiny brass even after years of use. 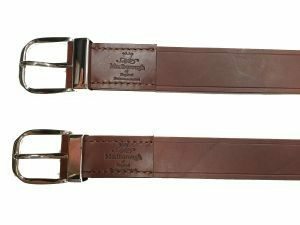 The belt is perfect for casual wear like that pair of cargo shorts or rodeo jeans. It’s also ideal for formal wear like that pair of dress or tux pants. Regardless of your choice of bottoms, our leather belts will make you look like a stud!